Wanna stay in a Pod? There is a new architects dream coming to town, or more precise to Qatar. 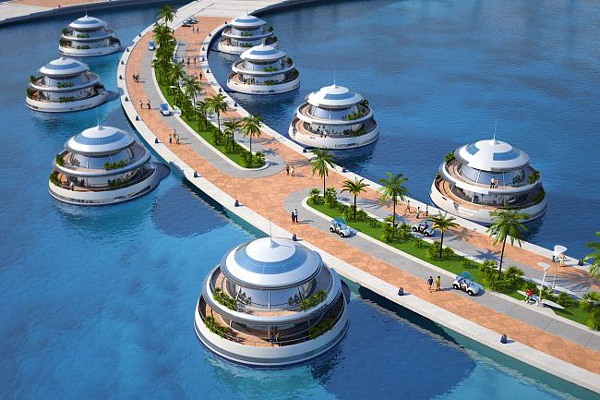 The semisubmerged hotel resort called “Amphibious 1000” was designed by Italian company Giancarlo Zema Design Group. At an estimated cost of $ 500 million is this gem somehting really special as you can see from the pictures. The hotel complex will include residential buildings, offices and marina with modern bay. In the central tower will house a restaurant that offers exotic dishes in addition to stunning panoramic views. Guests can stay in the 80 semi-submersible suits, which were called “Jellyfish.” The rooms have wonderful open views to the underwater artificial reefs. On the territory of the hotel complex will be used only electric vehicles and small aluminum boats with hydrogen engines. Pack your bag and lets go! This entry was posted in Qatar on 2011/08/20 by Trailsurfer.